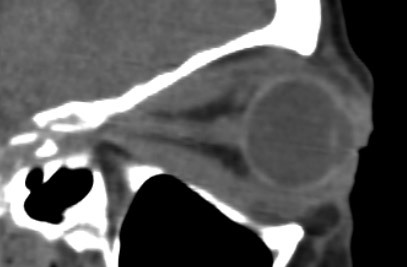 CT scan showing proptosis and muscle enlargement in severe TED. Abnormal activity of the thyroid gland can lead to inflammation in the delicate tissues within the orbit (eye socket). This inflammation is a form of ‘autoimmunity’, but the exact factors which link thyroid disease and TED remain uncertain. TED usually affects both eyes (although may be asymmetrical in degree), with women being affected more often than men. The diagnosis and severity of TED is made by detailed clinical examination; there is no investigation which alone allows the clinician to diagnose or monitor disease. Treatment includes conservative measures in most, but strong immunosuppression can be required when the disease is severe. Orbital decompression, muscle and eyelid surgery are sometimes required where there has been significant orbital inflammation, or where there is a threat to sight. Radiotherapy is considered to reduce the inflammation and allow lower doses of immunosuppression to be used.